Foot and ankle issues can affect your daily life, making it difficult to participate fully in activities you enjoy – even work or school. The highly trained providers at Powell Orthopedics & Sports Medicine are experts in foot and ankle care. Our knowledgeable orthopedic surgeon, Dr. Thomas E. Powell, has years of experience diagnosing and treating foot and ankle conditions in the Birmingham, Alabama area. 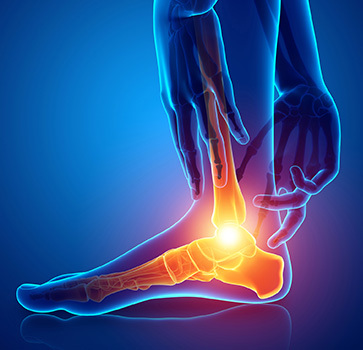 The most common causes of foot and ankle disorders are poor circulation, aging, arthritis, diabetes, infections, nerve damage, and sports injuries like fractures and sprains. Dr. Powell specializes in state-of-the-art minimally invasive surgical treatments, as well as traditional surgery and nonsurgical treatments, depending on the severity of your foot or ankle issue. For top-notch foot and ankle care in Birmingham, Alabama, make an appointment at Powell Orthopedics & Sports Medicine by calling (205) 877-9191 today. You can also use our online appointment request form.